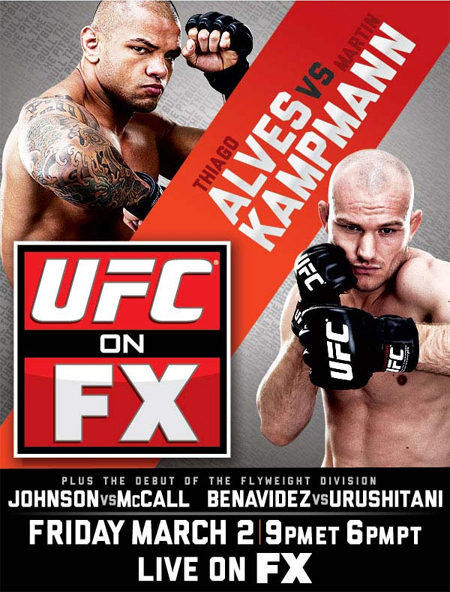 “UFC on FX: Alves vs. Kampmann” took place Saturday (Friday in North America) inside Allphones Arena in Sydney, Australia. Demetrious Johnson and Joseph Benavidez were victorious in the organization’s first flyweight fights. They will meet in the tournament finals for the 125-pound crown, which is expected to take place later this summer. A thrilling welterweight showdown between Thiago Alves and Martin Kampmann headlined the festivities. Kampmann rallied to submit Avles with less than a minute remaining in their contest. 1stRound: Jordan connects with a left hand and Thompson counters with a one-two combination. Jordan tags him with consecutive uppercuts and follows up with a left. Thompson’s left eye is already banged up. Jordan unleashes a right, uppercut and knee flurry that drops Thompson. Jordan pounces, but his opponent manages to scramble free after eating some knees. Both of Thompson’s eyes are battered now. Jordan, 10-9. 2ndRound: Thompson lands a solid leg kick. Both heavyweights are flinging leather, but nothing devastating has landed. Jordan clocks him with a huge uppercut and Thompson appears dazed and confused. He floors Thompson with an uppercut and knee. Jordan goes in for the kill. Game over. 1stRound: They exchange knees to the midsection while clinching against the fence. Semerzier scores with another knee. Pineda takes a kick to the groin and time is called. Game on. Pineda comes out firing and instantly drops Semerzier with a left hook. He jumps into full mount and locks in a triangle choke, then transitions to an armbar submission. Semerzier is forced to cry uncle. 1stRound: Waldburger nails him with a left hook. Waldburger secures an early takedown, but his opponent attempts a wizard to try and reverse. Hecht gets caught in an armbar submission for his efforts. It’s a wrap. 1stRound: Noke immediately leads him to the mat. He quickly takes Craig’s back and attempts a rear-naked choke to no avail. Noke slams him back down to the ground. He’s unloading some violent ground-and-pound. Craig wiggles loose. Noke, 10-9. 2ndRound: Not much action to start the middle stanza. Craig remains cool and collected in his big league debut. He takes Noke down with two minutes to go. After bloodying Noke’s face, Craig lets him to his feet for a moment before planting him back on the ground. Craig, 10-9. 3rdRound: Noke’s single-leg takedown attempt gets thwarted. Noke is clearly the more fatigued fighter, trying desperately to get the fight to the ground. He finally secures a takedown, though just for a brief moment. Craig now puts Noke on his back with a powerful double-leg takedown. He didn’t land too many shots, but held Noke there for the last minute of their scrap. Craig, 10-9, and rallies to win the contest, 29-28. According to UFC president Dana White, Noke blew out his knee in the opening round. 1stRound: Siler connects on several leg kicks to start things off. Miller has him clinched against the fence. Miller is tripped to the ground for a moment. Miller scores his first points of the scrap with a left hand, but eats numerous punches in return. Siler is much quicker to the punch. He attempts a guillotine choke as the horn blares. Siler, 10-9. 2ndRound: Siler is taking it to Miller early, landing punches in bunches. He tags Miller with three straight unanswered left jabs. Miller marks up Siler’s face with a combo. They are exchanging in the pocket. Miller eats a big body shot. Siler, 10-9. 3rdRound: Miller is just unable to get anything significant going. Siler has continued to land first and more frequently. Miller lands a front kick to the face. Miller hits him with a jab and is trying to drag Siler to the mat. A much better round for Miller, but it may be a case of too little too late. Miller secures a takedown and lands in full mount. Miller, 10-9, but loses the contest, 29-28. 1stRound: Perosh nails him with a combo, but eats a big left in return. Penner is already bleeding under his left eye. Perosh takes him to the mat and drops a couple of shots before Penner executes a sweep. They are back to their feet. Penner has him clinched against the cage. Perosh lands a knee to the midsection as they separate and secures a takedown with 90 seconds remaining. He advances to full mount and is raining bombs. The fight is called with just a second remaining in the frame. 1stRound: Both light heavyweights are swinging for the fences and landing equally. Te Huna is blasting him with countless shots to the dome. Blood is gushing from Rosa’s face. Te Huna clocks him with several punches and drops him like a sack of potatoes. Game. Set. Match, Te Huna. 1stRound: Philippou circles the outside of the Octagon for the first minute. McGee hits him with a right, Philippou counters with a combination that’s highlighted by an overhand right. Crowd starts to boo due to inactivity. Philippou clocks him with a right hand. McGee has been unsuccessful on a couple of takedown attempts. McGee eats a left hook just as the horn sounds. Close round to score. Philippou, 10-9. 2ndRound: Philippou starts things off with a left hook. McGee has taken the center of the cage for most of the fight, but Philippou is landing cleaner shots. Philippou stuffs a takedown attempt. McGee gets denied on another takdeown attempt and eats an uppercut for his troubles. Philippou scores with two powerful uppercuts. Philippou, 10-9. 3rdRound: McGee charges forward and scores with a combination. Philippou takes a kick to the groin and time is called. Game on. McGee briefly put his opponent on the canvas. McGee lands a flying knee. He tags him with a leg kick, but Philippou responds with a left hand. McGee just can’t get him down. Philippou, 10-9, and sweeps the cards, 30-27. 1stRound: Clear speed advantage for Johnson, though McCall is able to get his hands on him and trip “Mighty Mouse” to the mat. Johnson manages to reverse and get to his feet. McCall catches a kick and trips him to the ground for a moment. Johnson wobbles him with a big right hand. Close round to score. Johnson, 10-9. 2ndRound: Johnson dives for a single-leg, but connects on a right after it’s thwarted. They exchange leather in the pocket. Johnson takes a kick to the groin and time is called. Game on. Nonstop, back-and-forth action with both landing their fair share of strikes. Another tight one to score. Johnson, 10-9. 3rdRound: Each of the opening stanzas could have gone either way, so this will be interesting. That was strange; McCall appeared to take a nut shot but time wasn’t called, Johnson paused for a second then continued his attack. Johnson connects on a knee to the midsection, though gets taken down for his efforts. Johnson gets to his feet, McCall slams him down and unloads several bombs from behind. Johnson scrambles free. McCall takes him back down and advances to full mount. He’s giving Johnson the business. McCall, 10-9, but I have Johnson winning the first flyweight fight in UFC history, 29-28. 1stRound: Much jousting in the opening two minutes. Urushitani tags him with a right hook. Benavidez has him clinched against the cage and tries a shoulder throw, but eats a knee for his efforts. Benavidez working hard for a takedown and finally gets it. Benavidez takes his back with 30 seconds to go. He locks in a rear-naked choke as the horn sounds. Benavidez, 10-9. 2ndRound: Benavidez drops him with a right hand and pounces. He’s bringing the pain and the scrap is called. Johnson and Benavidez will meet in the flyweight tournament finals to become UFC’s first 125-pound champion. 1stRound: Alves immediately lands two powerful leg kicks. Kampmann gets a hold of a body lock and briefly gets the Brazilian to the mat. Kampmann rocks him with a front kick to the jaw and takes him down. Alves gets to his feet, but eats a knee to the midsection as they separate. Alves now plants him on the mat. “Pitbull” advances to full mount with a minute to go. Kampmann slips out the backdoor as the bell sounds. Alves, 10-9. 2ndRound: Alves connects on a left hook. He’s starting to light Kampmann up. “Hitman” is bleeding from under his right eye and nose. Alves clocks him with a big right hand. Kampmann comes with a flurry that’s highlighted with a knee to the dome. Alves, 10-9. 3rdRound: Alves tags him with a leg kick and dives in for a takedown to no avail. Kampmann forges ahead and hits him with a knee to the face while in the clinch. Alves continues to beat him to the punch. Alves clocks him with a right and goes in for the kill. He’s a tad careless with his assault while going for a double-leg takedown and gets caught in a guillotine choke. Alves is forced to tap. WHAT. A. COMEBACK! * – Was originally announced as a majority decision victory, then split decision win for Johnson.